One of the things I touched on briefly in my workshop session at the Articulate Roadshow was the idea of using lightbox slides to reduce cognitive load in your course. Building lightbox slides for certain items can reduce cognitive load and focus the learner on the meat of the content rather than forcing them to click through slides on how to navigate the course. The function of the lightbox slide is to be hidden until it is opened, and then closed (or hidden) when it is no longer needed. Let’s look at a few examples of using lightbox slides to reduce cognitive load. First, here is the simple lightbox slide I created for the Roadshow workshop that depicts five common lightbox options. Yes, I know there is the argument that it is 2018. Do we really need to tell people how to navigate an e-learning course? And for the most part I agree that it shouldn’t be needed. 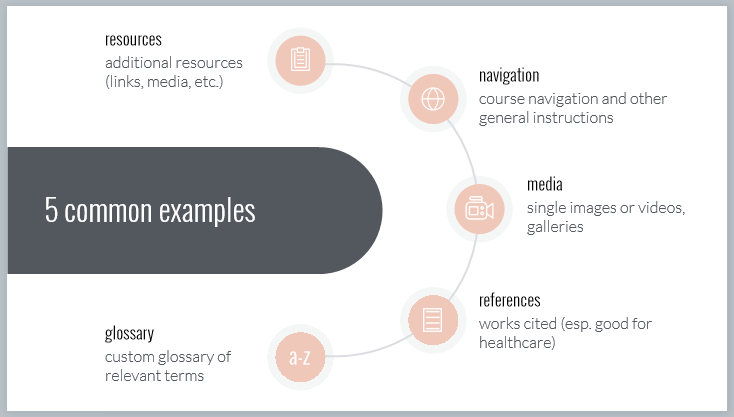 However, I’ve often built this type of slide to explain the functionality of a course (glossary, contact info, resources, information about course assets such as videos, and yes, how to navigate). Think about the fact that there might be a user that needs assistance. If that slide helps one user, it’s worth being built. Unfortunately, there is also another argument for building this type of slide – someone higher up than you is mandating it’s inclusion. 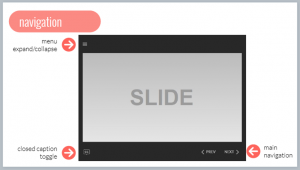 Regardless of the reason, if you are building a course navigation or functionality area, the lightbox slide is a great option. Putting this ancillary information on a lightbox slide pulls it out of the main flow of the course and recognizes that not everyone will need it, but it’s there for those who do. 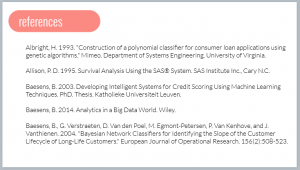 Depending on your industry, you may be required to include a references or works cited slide in a particular course. I’ve found this to be true in two sectors I’ve worked in – healthcare and statistical software training. You could make this the last or penultimate slide of the course. But again, not everyone will need (or want) to access this information. In my opinion, this information is perfect for a lightbox slide. It’s there if someone wants to investigate further, but again, it’s not crucial to the main flow of the course. 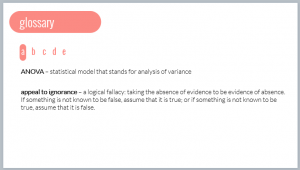 Say you want to build a custom glossary for a course. A glossary is a reference tool that is used when needed. In other words, it is an ideal candidate to put on a lightbox slide. It’s default state is hidden, but it’s always a click away when you can’t remember the definition of a particular term. Building lightbox slides for these types of ancillary content reduces cognitive load and puts more control in the learner’s hands. The learner can access this material at the time of need, rather than being forced to view it to complete the course. What do you think? What are some other ways to use lightbox slides to reduce cognitive load? On a fall day in October (between two hurricanes), I was a guest presenter at the Articulate Roadshow in Durham, North Carolina. I joined Tom Kuhlmann and David Anderson for a two-day workshop on building courses in Storyline. My topic was Practical Ways to Use Lightbox Slides. Since this was more of a workshop rather than a presentation, I built everything in Storyline. This made it a little tricky going back and forth between the finished examples to the actual build, but I think it worked well overall. To capitalize on the ease of use of Articulate 360, I built everything using one of the free templates included in Content Library. One of the Main Menu slides was particularly useful in showing 5 typical uses for lightbox slides. I decided to focus on four areas. And since the point of the Roadshow is hands-on learning, participants had time to build their own lightbox slides and ask questions as needed. Overall, this was a great experience for me. I’m humbled and thankful that Tom asked me to be a part of the workshop. And of course it was great to spend a little time chatting with him and David. I’m including the source file (mainly for the folks who attended and asked for it). 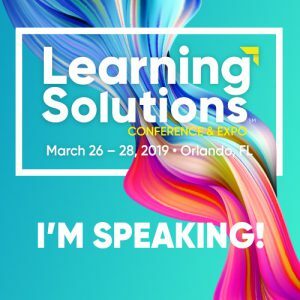 I also curated the following list of additional resources from the E-learning Heroes Community. Great e-learning challenge with ~40 examples submitted from the community. Check these out for inspiration and submit your own! Detailed article from Trina Rimmer, Articulate Community Manager, that walks through the process of creating lightbox slides. Clever example created by community member Adam Gavarkovs of building a lightbox note-taking area for learners. Video tutorial from Trina Rimmer on how to launch a lightbox from the course player. Articulate’s Mike Enders explains how to use a lightbox slide as a remediation technique.